Availability: Out Of Stock Only 0 Left!! 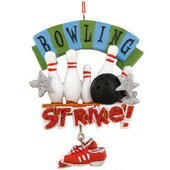 This colorful bowling ornament is beautifully crafted in resin with accents of shimmering glitter. A Black ball knocking down White pins forms the core of this dangling ornament with the words BOWLING and STRIKE emphasizing the action. This 4" tall christmas keepsake includes a dangling shoe charm and comes ready to hang with a red cord.